Cementing La Alameda as one of Seville’s hippest barrios, Casaplata avoids the classic design clichés more often associated with this city. 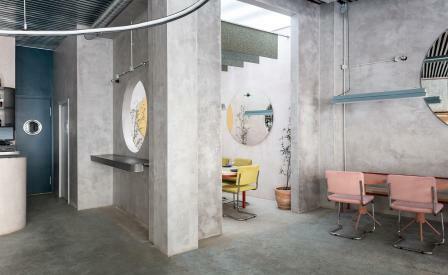 And so, on a base of unpolished concrete, the designers have layered candy-coloured pink and yellow velvet furnishings – Marcel Breuer’s Cesca chairs and the studio’s own collection – while sensual curves, including circular mirrors and lighting add a sense of warmth to the otherwise clean-lined space. Neon lighting meanwhile, adapts to the time of the day to meet the various offerings. ‘The neon lighting is projected at varying intensities and in different colours to meet the different audiences,’ explain the designers. Let yourself be tempted by the Spanish-style dishes from Jesús Merchante and Cristian Perez, such as the deliciously smokey roasted octopus served with wild rice; or the empanadas stuffed with bull’s tail.